If you’re used to the abundance of free WordPress themes, you might expect to have the same choice with WooCommerce. After all, it’s the most popular WordPress ecommerce plugin (we’ve got a nice introduction to WooCommerce if you want to come up to speed). Unfortunately, the choice of free themes created especially for WooCommerce isn’t as large as the choice for WordPress itself. As a result, when you want a minimalist theme for your WooCommerce site, you have two options. The first one is to (heavily) modify an existing WooCommerce theme and make it suit your needs. The second approach is to adapt a general WordPress theme. Basically, photography or image gallery types of themes are easier to adapt, but even a blog theme, or a magazine type of theme can sometimes do the trick. There is always the risk the adapted theme might not function properly. However, in some cases you simply need to go this route. For example, if your WooCommerce store is part of your WordPress blog, then for consistency, you might want to use the same theme on both of them. When I say there aren’t as many free themes for WooCommerce as there are for WordPress, this doesn’t mean there aren’t dozens, if not hundreds of them. However, not all of them are truly minimalist or totally free. Some of them, for instance this one are free as a sample only, but no personal or commercial use is permitted. After these clarifications, let’s now proceed to the list of free minimalist WooCommerce themes I’ve picked for you. If you are looking for a truly minimal WooCommerce theme, Shopping is one of the first to check. It’s a very popular theme and this is for a reason – it’s simple, elegant, minimalist, and it puts your products in the center. The home page shows thumbnails of your products with some very basic info about them, such as name, price, or rating (if applicable). Of course, you can clutter the home page with additional plugins, but since you are looking for a minimal theme, this hardly makes sense. Similarly, the product page doesn’t come with distractions – it shows a larger view of the product, some description, comments, if you enable them, etc. The Shopping theme requires the parent Omega theme. You don’t have to install the Omega theme separately. When you install Shopping via the WP theme install, Omega is installed automatically. 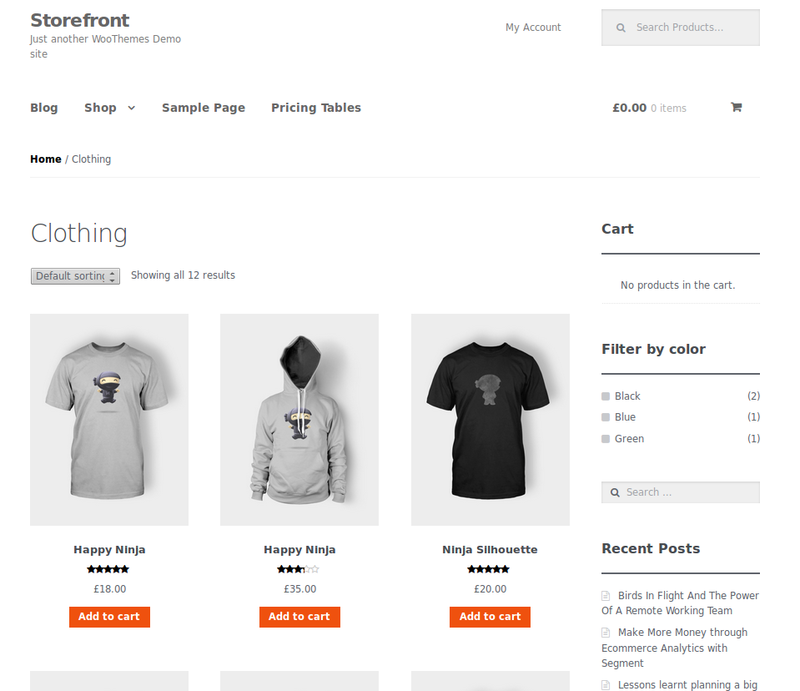 If you have been using WooCommerce for a while, there is no way you don’t know about Storefront, the official WooCommerce theme. 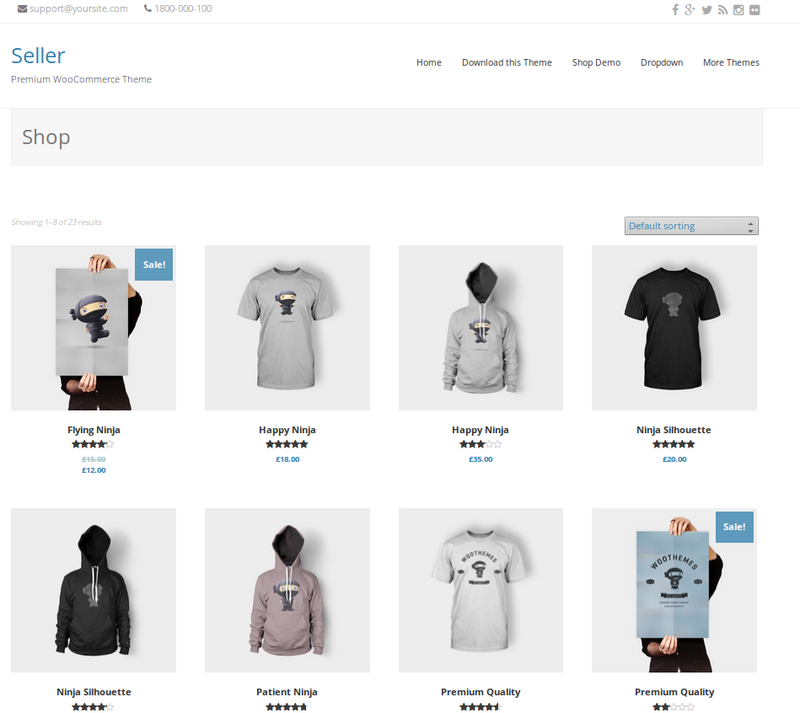 It’s probably the most popular free WooCommerce theme in general because it comes from the developers of WooCommerce themselves. This basically means you should expect fewer integration glitches and faster response times from their support team. 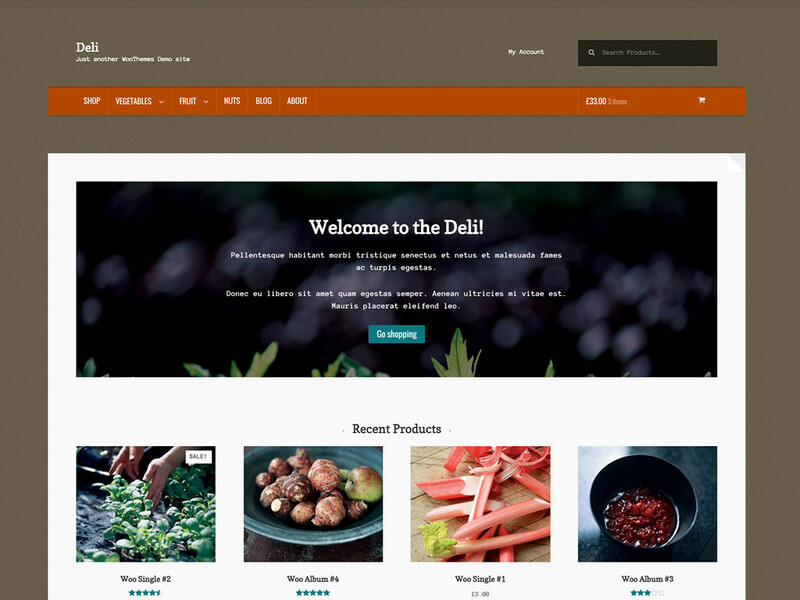 The Storefront theme has two great child themes – Deli and Boutique. They build upon the basic Storefront functionality and since they too are popular choices, I’ll review them separately. I wouldn’t call Deli a truly minimal theme because it has more design elements than what I personally consider minimal, but it’s far from cluttered. Deli comes with a texturised, earthy design. The color scheme is suitable, if you sell natural, organic, or hand made goods. As a child theme of Storefront, Deli comes with its all strengths and weaknesses. 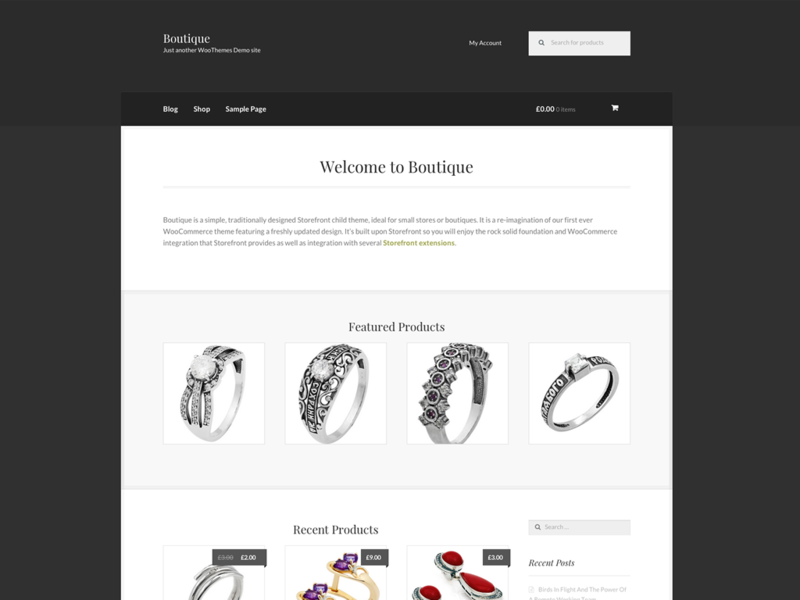 Boutique is another Storefront child theme you may want to consider. In comparison to Deli, Boutique is cleaner and simpler. Boutique is perfect for boutiques or any other type of a small online store. However, I don’t see a reason not to use it on a mid-sized store as well. 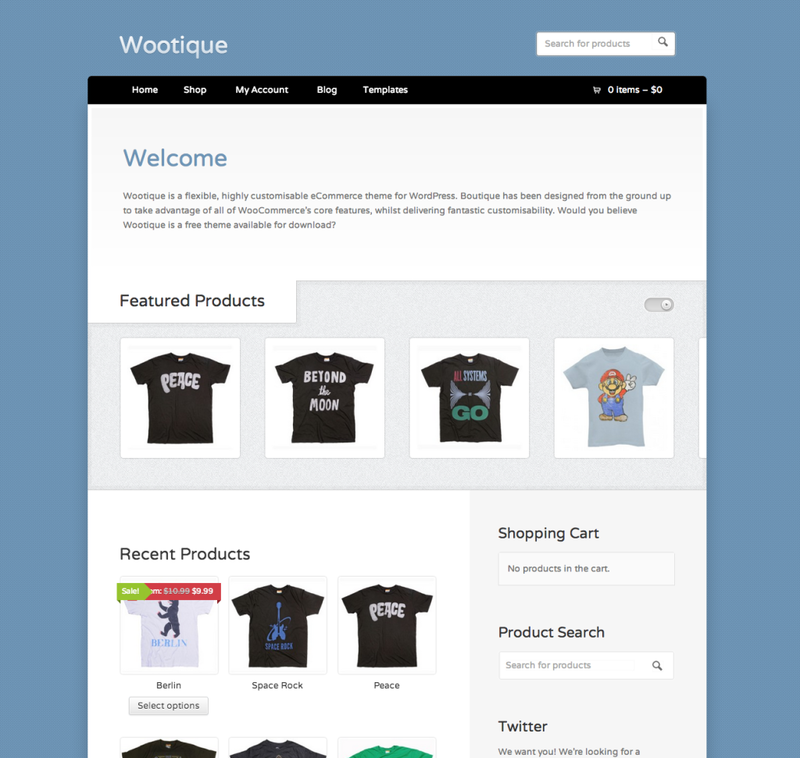 Here is one more theme from WooCommerce themselves – Wootique. It is another very popular WooCommerce theme built on the WooFramework – the same framework on which commercial themes are built. The theme is highly customizable. It comes with a featured slider and 8 custom Woo Widgets. You can use it for an online boutique or any other type of site. JShop comes in a free and paid ($9) version. Quite naturally, the free version has limitations. For instance, it is not responsive and requires a backlink. Additionally, its width is fixed at 980px and only 1 color is available. Both the free and paid versions are localization ready. The theme is not ultra-minimal, but it’s by no means cluttered. It has clean fonts and uses a lot of white space. It’s a general theme – you can use it on any type of shop, regardless of its size. WooShop Lite is one more WooCommerce theme I personally don’t consider very minimal. However since it does have a lot of functionalities, if you are looking for a not so minimal theme, it could be your best choice. 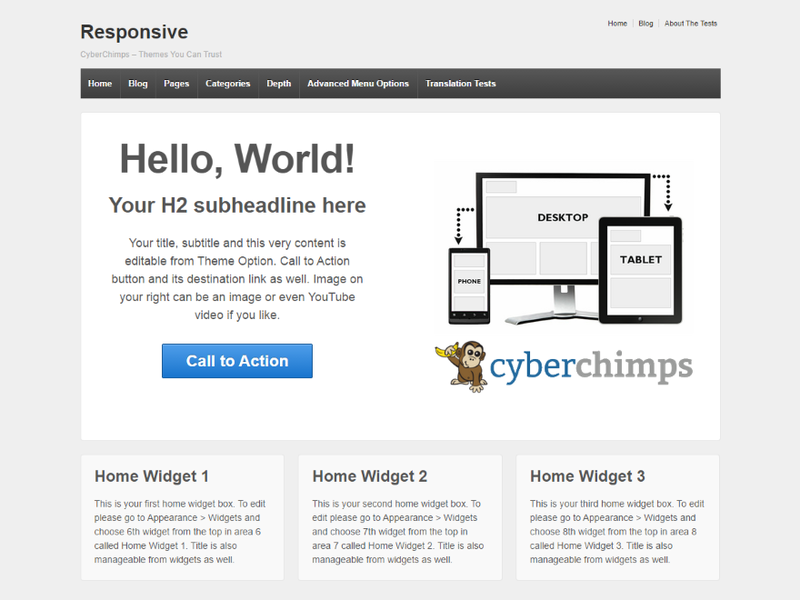 The theme is responsive and it works in all major modern browsers across various devices. WooShop Lite is social media ready. It uses shortcodes – in fact the Homepage layout is fully shortcoded. It’s internationalization-ready. If you like the Genesis framework, then this theme is just for you. As a child theme of the Genesis framework, AyoShop uses almost all its features. Again, this isn’t a truly minimalist theme, but if you don’t need a stripped to the bones theme, it’s fine. Among the numerous remarkable features of AyoShop, I will mention only its responsive layout and its unlimited color schemes. In order to download the theme, you need to sign in via Facebook, G+, or Twitter. Now, Responsive is a truly minimal WooCommerce theme. Unlike most of the other themes I picked, this one doesn’t have the typical look of a shopping theme simply because it’s not created especially for this purpose. Yes, it is WooCommerce compatible, but this is just one of its features. Responsive theme is more of a foundation with a fluid grid system you can use to build upon. The theme has 9 Page Templates, 11 Widget Areas, 6 Template Layouts, 4 Menu Positions and more. It is social media friendly, Multilingual Ready (WPML), and includes RTL-Language Support. Did I forget to mention it is Retina-Ready and that it has an official support forum, too? 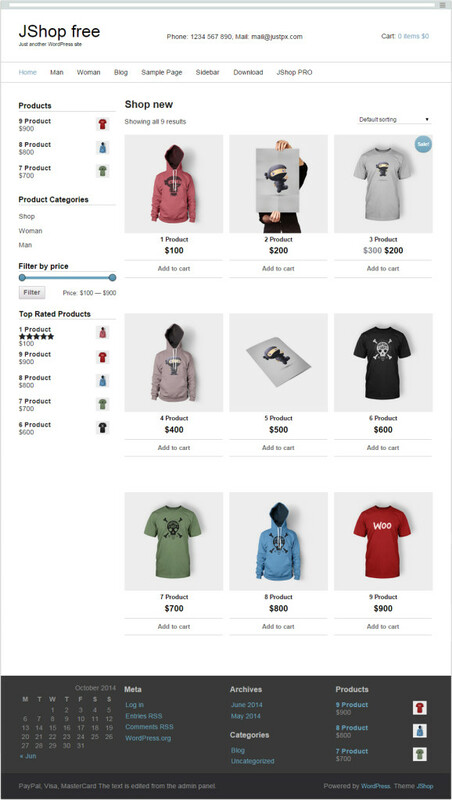 If you are looking for a WooCommerce theme to sell graphic goods, such as vectors, photos, or any resources for designers, then you should check iKonik Lite. Of course, you can use the theme on any type of site, where a horizontal slider (for new products) and a vertical slider (for featured products) are what you need. In addition to the sliders, the theme offers custom shop pagination, the ability to sort items based on Price, Alphabet, and Most Recent Products. iKonik Lite is neat and it offers really a lot. If you want to download it, you need to register and provide lots of data in order to get it. 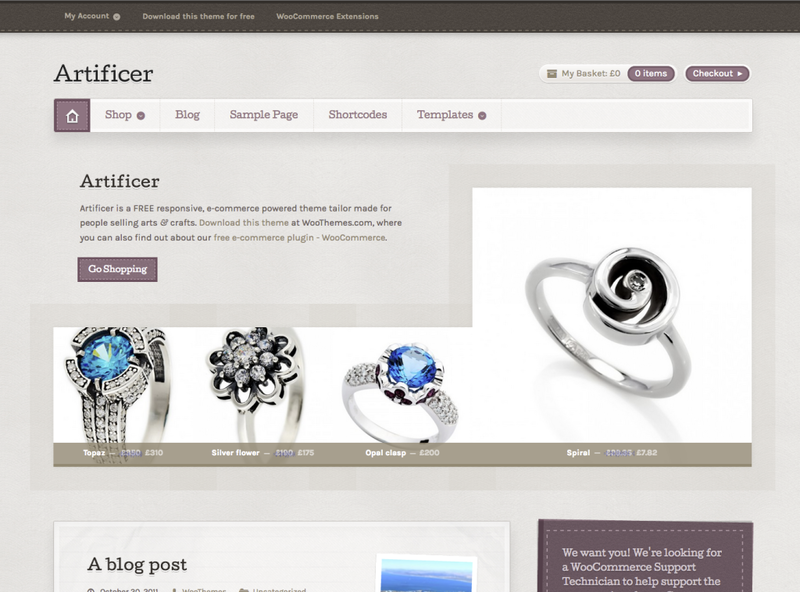 We are back to WooThemes and their Artificer theme. As most, if not all, of their themes, Artificer is built on the WooFramework. It’s a responsive theme and it runs on a wide range of devices. This makes it a great choice if you have a significant amount of mobile shoppers. Artificer is highly customizable. For instance, it comes with numerous color schemes, such as red, orange, yellow, green, blue, indigo, violet, brown, floral, industrial and honey. The last free WooCommerce theme on this list is Seller, from the creator of Market, another good eCommerce theme. In fact, Seller is an upgrade over Market. Seller is a fully responsive theme. It’s built on Redux (backend) and Bootstrap (frontend) frameworks. It has a grid layout, four column footer widget area, featured slider and many more. Seller is retina-ready, too. It has a blog functionality as well, so if you want to run a blog together with your shop, this theme allows this. There are many more good free WooCommerce themes that I didn’t mention on this list, but I believe those I’ve included are a good start. Check them out and see which one meet your needs best. Let me know in the comments below if you’ve come across any good WooCommerce themes that you think should have made this list.